I will enjoy the random determination of rolling a die each turn in 1-1 matches. "One through six it does damage to you?" @MaximumCDawg Valid points, except that Mentor doesn't win in a vacuum, either. Mentor is clearly better, that card could profit from its prevalence, though. Not affected by effects like Moat or Propaganda. To be fair, I overlooked the once per turn clause, makes it less explosive. That is 8 cards for 19 damage with a body on the field. It requires less cards, the same basic draw. I'm not saying its necessarily going to see play, but it does more, costs less, and leaves you in a better spot if they live. 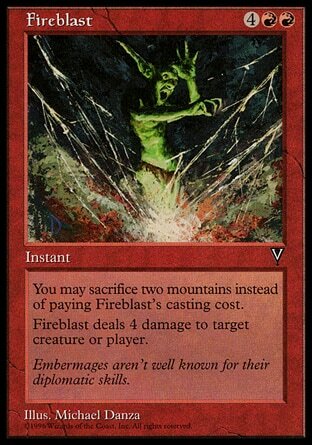 I think the same principal applies in vintage for sure, its just not as magnified in prominence because of the meta vintage has, but I think the other benefits Smasher has (untargeted, the number of pitch spells, etc) means its something to consider.